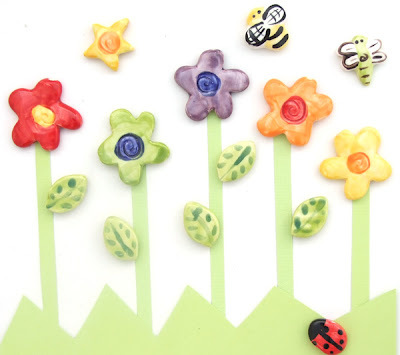 I think I mentioned the new flower beads I am working on... well I will be debuting some as well as some other new and springy fun beads over the next few weeks. Stay tuned. Next, I have been working on lots of craft projects lately. These are crafty projects that are all made with beads. I am going to declare March Jangles craft month. I will be featuring new projects every week for the month. Now what I think is the most exciting bit of information....Jangles is hosting a Creative Celebration. Here's the scoop. We are kicking it off today and it will all culminate on April 1st. Let me explain the Jangles Creative Celebration. It all starts with a contest. I will be hosting a jewelry design contest with fabulous prizes. Jewelry should contain Jangles beads. (I will explain the official rules in another post tomorrow.) On April first I will be hosting another online event. If you attended my Holiday open house, you know it was fun. This one will be similar, but not exactly the same. I will announce the winners of the contest that evening, as well as feature designs throughout the night. This is a great chance for everyone to get a little inspiration and if you sell your jewelry it's free advertisement for you. I will also be having some sort of sale, but don't ask me what it is right now because I don't know. I will be working on some door prizes and other fun things once it gets closer to the date. I hope you're all on board for some fun in the next few months. I will post the official rules in the next post. Feel free to pass it along to anyone you know, it's free to enter and there are some great prizes. Get your thinking caps on and start working on those designs.